A modern breed, the Queensland Heeler is also referred to as the Australian Cattle Dog, Blue Heeler, or Red Heeler. This breed was developed not for their appearance, but for their working abilities. They possess a silent work ethic, combined with stamina, to heard and drive cattle over Australia's rough and treacherous terrain. The Queensland Heeler is agile, athletic, robust, and muscular. This breed is superior and unmatched in herding duties. They are ever watchful, brave, always alert, and highly intelligent. The Queensland Heeler is not recommended for inexperienced or first time dog owners. The Queensland Heeler was never intended to be solely a pet. They are extremely protective, loyal, and independent. They are not recommended for homes with small children due to their herding and guarding instincts and tendency to nip at the heels. They are excellent guard dogs of family, home, territory, and herd. Queensland Heeler's do not do well with dogs they do not know or with small household pets. They require a dominant owner. Regular brushing with a firm bristle brush is required to remove loose and dead hair. Bathing should only be done when necessary. Ears should be checked often for debris and nails should be trimmed as needed. The Queensland Heeler is prone to such health problems as deafness, PRA, and hip dysplasia. 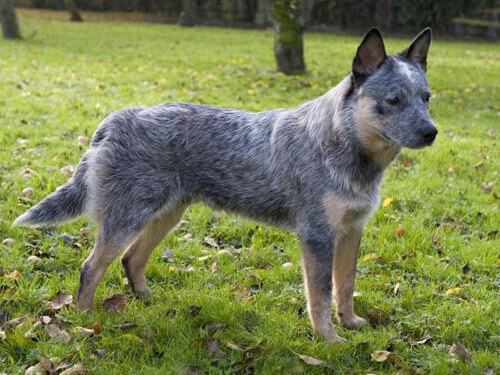 The Queensland Heeler is a double coat breed. The outer coat lays flat, is hard, smooth, and straight. The under coat is dense, soft, and short. The coat is water resistant. The coat is longer and more profuse around the neck, under the body, behind the legs, and on the breeches. This Queensland Heeler breed sheds heavily once or twice a year. Early socialization and obedience are necessary. The Queensland Heeler breed has a tendency to be willful and is highly independent and intelligent. Training must be done with firmness, fairness, and consistency. They excel in agility, herding, competitive obedience, performing tricks, guarding, and retrieving. The Queensland Heeler is not recommended for apartment living. This breed does best in a rural setting with a job to do. Activity is absolutely crucial to prevent boredom and destructive behavior. They require an inordinate amount of exercise.